There are many methods of Aquarium Overflows that drain water from an overflow box using standpipes. Many people don’t know much about an overflow even if it’s on their own tank. While they can seem complicated, even the more complex designs can be understood if you just look at what each pipe is doing. If you can understand each component, you will see how they can work together to move a lot of water safely and quietly. This should help you choose the right method for your tank. One thing to note — By only taking a couple paragraphs to describe each method, a lot of stuff is skipped over. There is no way I can explain everything in detail in only one post. Single pipe methods are very easy to explain because not much is going on, but more complex 2 pipe and 3 pipe designs need their own longer guides. Raising the inlet of a plumbing pipe inside your overflow allows you to keep the overflow full of water. If no standpipe is used then the water falling over the weir will fall a large distance and splash loudly. The 3 basic types of pipes. An open pipe is as simple as it gets. Water in the overflow will pass through it, but it gets loud as soon as you put even small amounts of flow through it. The echoing sound resembles a flushing toilet. If you add even more flow, the pipe will start and purge a siphon, and the overflow will not be stable. 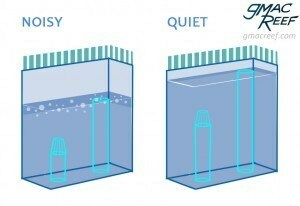 For this reason, people have been coming up with ways to make a drain that is both quiet and has a lot of capacity. If the pipe is of significant diameter (1.5″ or larger) with not much flow (say under 400 GPH), then the level of noise can be acceptable on an open drain. Still, its not really a good idea to run an open drain by itself because of the lack of failsafes. These are all single-pipe methods and a variation of the same idea. Take an open pipe, submerge the inlet opening, then vent air through the top. the result will be a more or less quiet pipe (compared to an open drain that is). These contraptions work because the air vent prevents a siphon from starting in the pipe. Any time a drain’s opening is submerged in an overflow box by a few inches of water, it will want to go into siphon mode. Unfortunately an unregulated siphon causes havoc as the pipe fills with water, then rapidly purges. This will go on over and over again. The water in the overflow will never be constant. Hence the reason for the air vent – to prevent a siphon from forming. Although the hole vent is typically very small, a considerable amount of air is drawn through it. The water and air mixture that travels through the pipe down into the sump mixes together vigorously. The bubbly water dumps into the sump. When the water exits down in the sump, even more bubbles are created. The bursting bubbles result in salt spray — and salt creep on the surrounding surfaces. One shortfall of these vented drains is that they are only quiet when at the low end of their flow capacity. Up to about 25% of capacity, water flows down the walls of the pipe. If you could look top down into the pipe, you would still see air in the middle of it. At this point there is hardly any noise because the drain isn’t drawing in any air down the pipe yet. Once you increase the flow of water past this point, the drain begins to draw in a considerable amount of air. The air and water mixture becomes very turbulent inside the pipe. It starts to make more noise as flow is increased. For this reason, large plumbing diameters (1.5″ and up) need to be used in order to keep the pipes running quietly. This is usually not an option on many smaller tanks. The Durso is very simple and it was implemented in many commercial “reef ready” tanks. They are still very common despite the fact that they have no safety backup and are typically loud. Still, some people prefer them as they don’t mind the noise and extra aeration they provide. 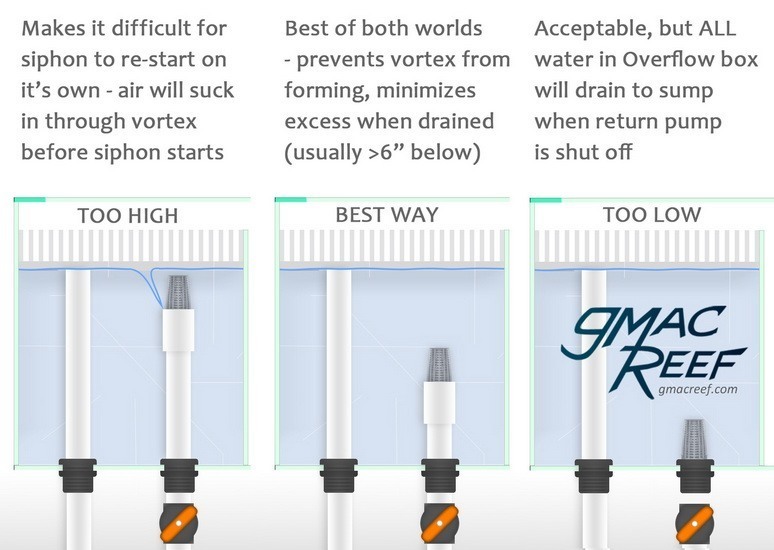 Many people convert these types of single drain systems into siphon valve based overflow methods like the Herbie (2 pipe) or Bean (3 pipe) design to get more capacity and take advantage of the other benefits of a siphon system. 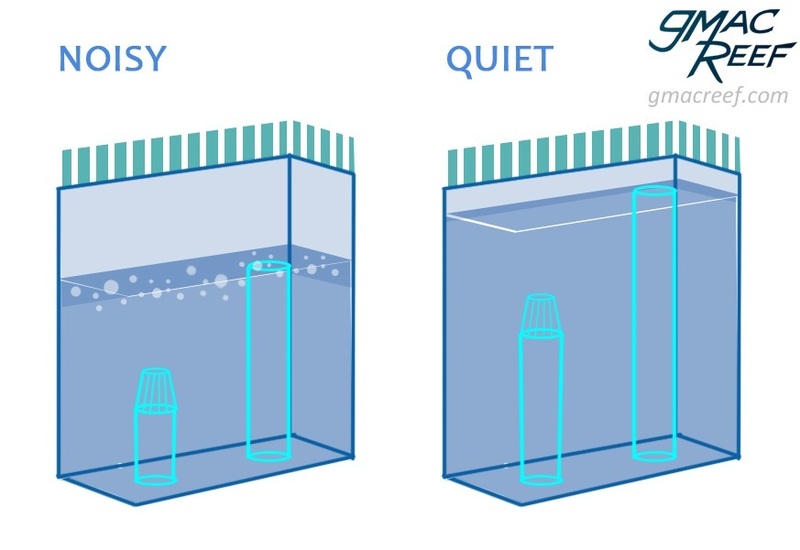 Siphons are silent when running and have much more capacity and safety measures than a Durso or vented drain. They also produce no bubbles. A valve placed under the drain line’s bulkhead is how the siphon is adjusted. Any time you run a siphon pipe you must use an secondary emergency pipe. 2 pipes must exist separately. You are purposely constricting the flow of the drain with a siphon valve, so the emergency line must be present for a safe system. A two pipe design, consisting of a valve-controlled siphon drain and an emergency line next to it. The siphon pipe has a valve on it — allowing for it to be balanced against the rate of flow from the return pump. This creates a consistent resting water level in the overflow. With the correct height of the standpipes and a submerged outlet, the siphon will reliably re-start when the return pump loses power, and then starts pumping again. No manual adjustment is needed. The emergency drain’s primary purpose is to take on water if the siphon drain is clogged Many people also allow a small amount of water to trickle into the emergency line to reduce the amount of periodic manual adjustments needed on the siphon valve. Running a trickle down the E-drain is controversial but nonetheless widely practiced. The Herbie method is a common way to quiet down an existing overflow box with 2 standpipes present. Many times an existing return line is converted into a drain line, then the return is plumbed over the back of the aquarium. A 3 drain overflow is often referred to as a Bean Overflow. It is widely considered the best overflow method. The original Bean design refers to a specific implementation — a coast to coast overflow with a relatively shallow box containing the pipes. The Bean design uses the same valve-controlled siphon drain as the Herbie setup. That is where the similarities end. The second pipe acts very similar to a Durso because it is vented with an air hole — preventing that pipe from being a siphon and making it quiet. It is commonly referred to as the “open channel”. This makes it easier to operate because you don’t have to adjust the siphon nearly as much. Small variations in flow are taken up by the open channel drain. By adding a third pipe — a dry emergency drain — safety is increased. The system also gains capacity because unlike the Herbie, the open channel can take in more water than just a trickle. Because a dry emergency line is always there, there is an extra safety measure in place. For this reason it is common to see siphon inlets with no strainer (a must with a Herbie) and toothless overflow weirs being used with the Bean system. In the last few years there have been a few companies making external overflow boxes out of acrylic that use a 3 standpipe overflow design. They can be installed by drilling a few holes in the tank. An external box housing the pipes is connected to a smaller overflow weir box inside of the tank with bulkheads. Two such models of these boxes are the Reef Savvy Ghost Overflow and the Synergy Reef overflow. These go for about $200 USD. In their own category, these were created in order to get water down to the sump from tank without having to drill it. They utilize a siphon to pull water up and over the lip of the tank and hang on the trim. Overflow boxes are fundamentally flawed in that they rely on a siphon with no backup. Because a siphon’s action can stop, there isn’t a reliable way to ensure that the tank wont overflow from the return pump. The pump runs 24 hours a day and the water needs somewhere to go. Some models will employ a pump to constantly provide negative pressure to the pipe that carries the water. The idea is it will quickly restart a siphon when power to the return pump is stopped and then re-started. Unfortunately these pumps are often in the 20 dollar range – not having your tank overflow is too big of a responsibility to put in the hands of a cheap pump. These contraptions have so little capacity and complete lack of any type of failsafe that they do not worth mention. A flood waiting to happen. 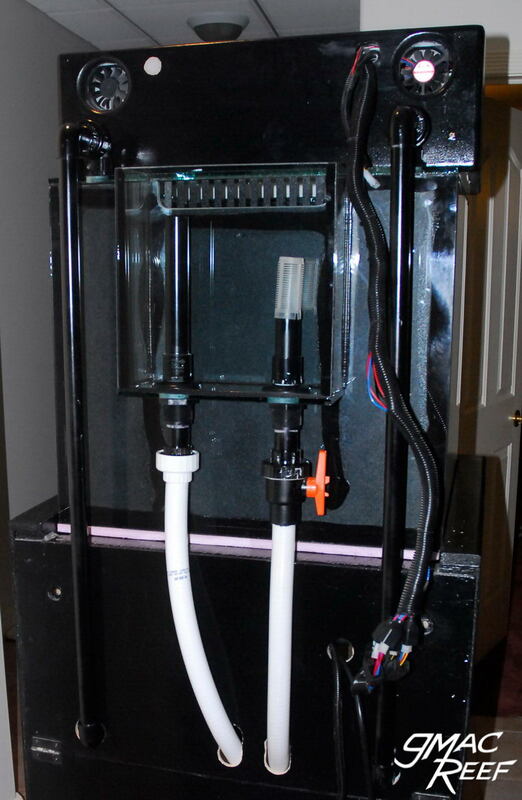 Many aquariums with dual overflows can be retrofitted to use a siphon-based Herbie Overflow. This post assumes a bit of understanding of the system so read through that if you’re just starting out. Having more than 2 pipes available allows for a secondary dry emergency line in some configurations. Those may be considered a Bean Overflow by some people. It has been a common practice in the past for builders of these larger reef tanks to set them up with the “reef ready” design. Inside each overflow are two holes for bulkheads; one for the return, and the other for a single-pipe-drain. Some common brands are Marineland, Perfecto and a few others. If you have two pipes in the same overflow with different diameters, then always use the larger one as the emergency drain. You want it to have maximum capacity that matches or exceeds the capacity of the siphon drain. With a long tank that has 2 overflows, it becomes more important to make sure it sits on a level surface so that the overflows take on the same amount of water at each end. Single-pipe-drains require no adjustment, but have several drawbacks. Air and water move through the drain at the same time, creating noise. There are many contraptions that attempt to quiet the drain with varying success (Durso, Stockman, Hofer etc.). 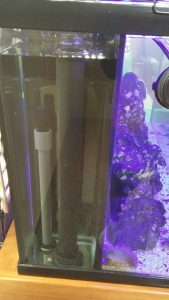 If air moves down the pipe, there will be splashing down in the sump which can generate microbubbles or lead to salt creep. These drains also have only a fraction of the capacity of a siphon-based drain. By converting the tank to use a siphon-based method like the Herbie or Bean method, the drains become silent and get more capacity to move a lot of water. Reef-ready tanks may have small bulkhead openings compared to the size of the tank. Do your homework with flow rates and required turnover if you have a tank with anything less than 1″ bulkheads in the overflows. These tanks often come with a return line running up through the overflow box. These are often changed into siphon standpipes with a Herbie conversion because they are often the smaller of the two in diameter. Due to the sheer volume of a tank that has two overflows – It’s often a really good idea to have a 2nd emergency line available. With this setup, both overflows have both a siphon drain and emergency drain — like you would on a tank with only one overflow. You may want to adjust one siphon so that it takes on less water, just enough to provide adequate surface skimming. 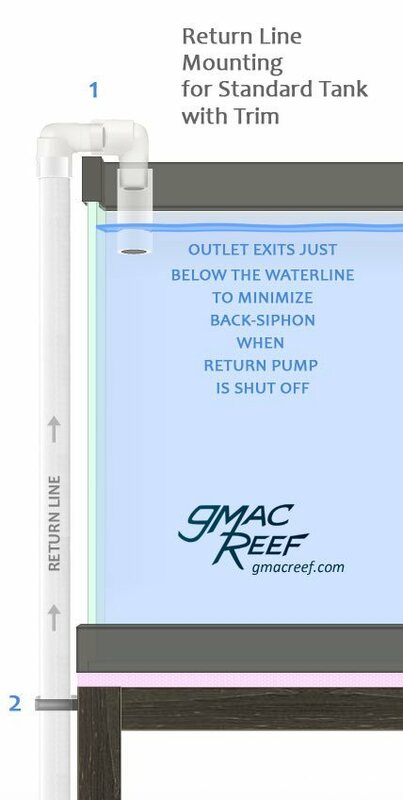 The other siphon can then be used as the main point of adjustment, and can be the one that is easier for you to access. With the amount of water that an single Herbie can move, having two means the siphon valves will be closed-off a considerable amount. This can mean finer adjustments are necessary. Having two independent overflows can result in having to do too many fine adjustments which can be tedious. For this reason, some people choose to go a different route. If the two overflows can be connected with a “Tunnel” of sorts, then they will act as one overflow with two weirs. This is commonly known as a Balance Pipe. A pipe that spans behind the tank, passing through a bulkhead at the rear of each overflow. It could also be done inside the tank, but wouldn’t look very good unless covered with sand. You will want the bulkheads for a Balance Pipe lower in the overflow so they are always submerged (below the siphon intake). Larger diameter pipe will allow water to equalize between the two overflows quickly. Strainers on each bulkhead opening will ensure that nothing gets in the pipe. This setup allows for 2 pipes to be used as a typical siphon / emergency combo. The third pipe is used as the primary emergency and the fourth pipe can be used either as a secondary dry emergency, or as a return output running over the overflow wall into the tank. If the diameter of the drains are of sufficient diameter — only one overflow may be enough. Your main overflow would operate as a conventional Herbie drain setup with 2 standpipes (siphon and emergency). In the unused overflow, one pipe is used as a dry secondary emergency, and the other as a return. This method would makes the 2nd overflow dry. In order to keep it dry, you would have to slightly raise the level of the weir slightly. On this dry overflow water would only enter in the unlikely event that both the main siphon and emergency were completely blocked. If you don’t raise the weir on an unused overflow — it fills with water, and a chamber of nearly stagnant tank water is undesirable. Some people wish to have only one drain line going to their sump, so they attempt to join the two Herbie siphons together. This is usually done below the tank under the bulkheads by using a “T” fitting. This setup should be avoided. You see, it is nearly impossible to keep the water level in two separate overflows balanced if they’re connected by the drain line. A siphon will always function as one unit, so the two intakes will affect each other no matter what. No configuration of valves or having equal lengths of pipe will change this. The reason is that there are slight variations in flow from each siphon, like algae on the strainer or overflow teeth. These variations will always be present and changing the flow in the pipes over hours or days. One line will always affect the other if they connect in any way. 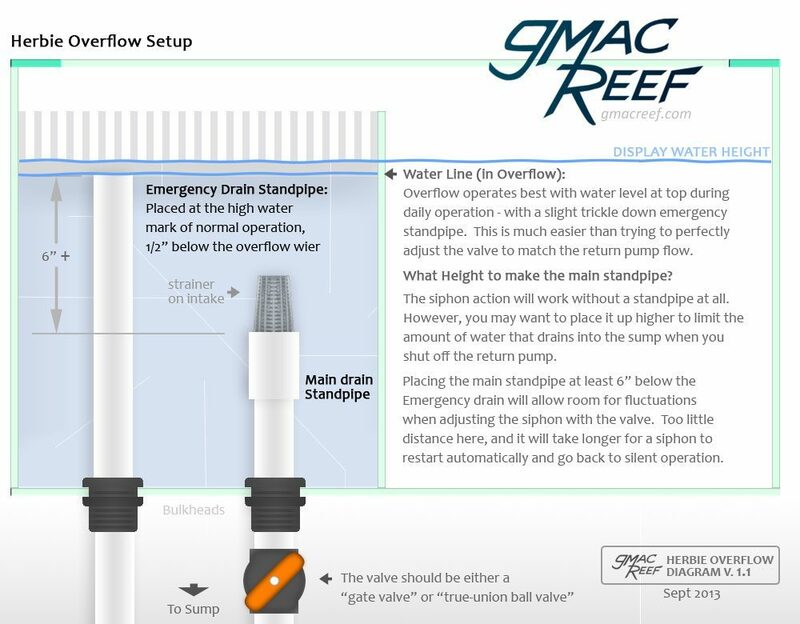 Gaining control over the water level in each overflow is only possible with individual siphons, or by connecting the two overflows with a Balance Pipe. 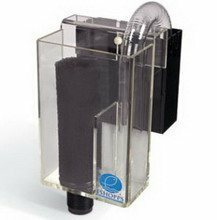 A siphon must have it’s own independent valve and pipe extending down into the sump water to a chamber with a constant water level. What about Teeing both Emergency drains together? Never do that – Anything that lowers capacity of an emergency drain should be avoided at all costs. Ideally an emergency drain will go full-siphon, and this would be hindered by being Tee’d into another pipe. Siphons also can’t start as easily with with horizontal runs in the drain line. have it be completely fail-safe from possible flooding with proper design and maintenance. It is the simplest plumbing method that accomplishes both of these things. The method was popularized by a Reefcentral.com thread started by a forum member “Herbie” around 2004. As people started using the method on their tanks, many forum threads started and there are literally hundreds of posts out there about it. The difficulty lies not in the method itself, but in sifting through all those bits and pieces of info just to figure it out. This guide explains the regular operation, each component of the design, and gives tips along the way. For the sake of simplicity, all of the content and diagrams describe the most simple and conventional Herbie setup, — an overflow box with standpipes coming in through the bottom. In some cases the pipes will have to pass through the side of the tank, but the mechanics of everything will be the same. There are all kinds of people out there who run the system in one form or another, and they all have a slightly different opinion on how they think things should be done. I am only one of these people. the most important thing is to understand your own setup. You can choose to do things differently with certain parts of the design, but try to be aware of any risks you may be opening yourself up to when you do so. There is another similar method called the “Beananimal” drain (also named after its creator) which is slightly more complicated in design and uses 3 standpipes vs. only 2. The Beananimal is superior in many ways including running a “dry emergency” drain (increased safety), and having much more capacity than the Herbie design. For the sake of clarity, I won’t attempt to explain the Herbie and BeanAnimal designs at the same time. The goal is that you will not only understand the Herbie design after reading this, but start to see it’s limitations. Any time you have air and water flowing through the same drain, you’ll get noise with even low amounts of flow. This is the main shortfall of single-pipe-drain methods like the Durso and it’s siblings. 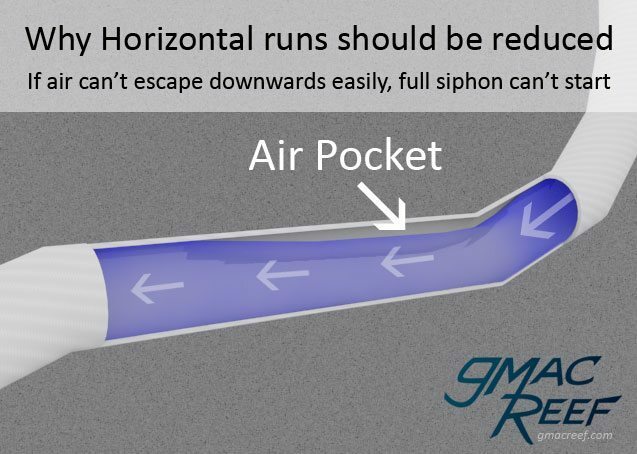 Aside from running silently, a siphon drain has much more flow capacity because air never runs through the pipes once it gets going. 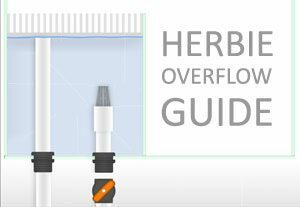 The way the siphon on the Herbie is achieved is by manually constricting flow on the main drain with a finely-adjustable valve. Once the air is purged from the line and the siphon is fully engaged, it continues to run this way 24 hours per day until something interrupts flow like the return pump being shut off. The rate that a siphon moves water is similar to a return system. For a return pump, the greater the distance the pump has to push water up to the tank against gravity, the less flow exits the return outlet. So for a siphon, it is working with gravity — water moves through the pipe faster the further it has to fall straight down. So as you increase vertical distance between the inlet in the overflow and the outlet down in the sump, water moves faster. Ideally the siphon pipe should run straight down to the sump, with no excessive horizontal runs (anything less than 24″ generally is no problem). This isn’t always possible, but you should keep it in mind. Flexible pipe can make curves more gradual, and can using 45° fittings instead of 90°’s for bends on rigid lengths of PVC. To begin, the valve is opened all the way — then slowly closed off until the siphon is achieved. Fine adjustments are then made until the flow of the siphon closely matches the amount of water being returned to the tank, which will stabilize the water level in the overflow. Perfectly balancing the water level until it remains totally still inside the overflow is difficult and time-consuming to achieve even with a Gate valve. Although it can appear stable and stay that way for a while, slight variations in the system such as changes in resistance of water through the plumbing will inherently change the rate of flow over hours or days. For example, the growth of slime in the pipes. Simply by allowing a very slight trickle of water to enter through the emergency standpipe at all times, you sidestep the nearly impossible requirement of perfectly adjusting the valve. We are talking a trickle here — just enough to negate the need for constant fiddling, but still allowing the emergency drain ample capacity if needed. To accomplish this, you simply stabilize the water level as best you can inside the overflow, then close off the valve’s flow a very tiny amount past that point. After this tiny adjustment, the water level inside the overflow will rise, very slowly, and come to rest at the level of the emergency standpipe — where the trickle of water will begin seeping down it. So what is a Trickle? Using a term like “trickle” leaves the actual amount to interpretation. If you fill a styrofoam cup with water then poke a hole in it with the lead of a pencil, you will get an idea of what to aim for (and allow) with your trickle. Think “seeping” and not “flowing”. What happens when a siphon valve is adjusted. In real time the water would take up to a full minute to reach the E-drain after the adjustment is made. Inside the overflow box, the operating water level remains up at the top. Water passing over the the weir falls only a short distance, so it won’t splash and create noise. A trickle of water breaks the surface of water inside the overflow, preventing any scum from accumulating. The need for constant adjustments is reduced considerably. Sounds great, right? But don’t forget – Your Emergency line goes from dry to wet. Running any amount of flow down the emergency adds risk to the system. It’s a level of risk that many choose to live with and minimize the best they can, but present nonetheless. Let’s Pause Here… For the sake of discussion, I’ll mention a debate that currently takes place. It regards running an Emergency drain with the Trickle method. There are some people who think that running a strictly Dry Emergency that never touches water is the only way it should be done. Due to the need for fine levels of adjustment, installing a quality valve is suggested. This valve allows precise adjustments to be made with a minimum effort. The “Spears” gate valve (shown) can be taken apart and is regarded as the best available option. The higher quality ones have a smooth opening/closing action, and built in unions which are an advantage. 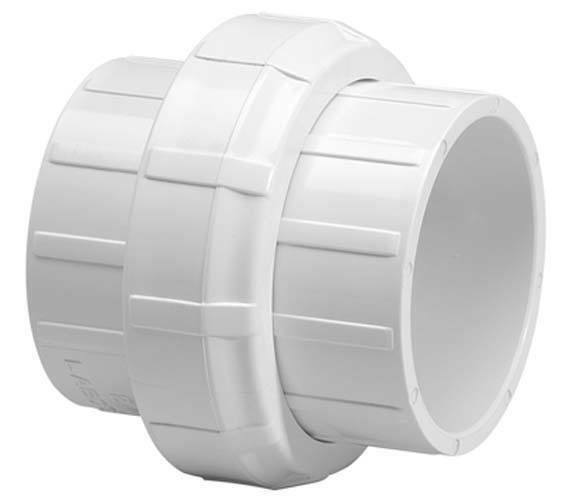 A “Single Union Ball Valve” or “True Union Ball Valve” are the only ones that should be used. They are cheaper and easier to find than gate valves. The common “Straight Ball Valve” should be avoided. If the valve doesn’t have a union built in — one should be installed between the valve and the bulkhead so you can easily detach your hoses and get to the valve assembly with relative ease. Even a quality valve will tend to start to get sticky and eventually seize up after months or years in a high-calcium saltwater tank. To remedy this it’s a good practice to detach your valve and get rid of any deposits. Soaking the valve in vinegar works well, but be sure to remove the rubber seals first. The vertical position of the valve on the siphon line plays a part in how fast the siphon starts. All things being equal, the siphon will purge air and start faster if the valve is down closer to the pipe’s outlet. This is because as water fills the pipe, the air exits the high section of pipe easier than the low section that’s after the valve. That is — less air needs to purge and exit the pipe downwards. A simple and common way to run your setup is with the sump in the stand below the tank. This means the siphon line coming down from the display tank is only a few feet long. You can help the siphon start quickly by doing a few things: Plumb the drain with a minimal horizontal run, and have the drain outlet the proper height. When the siphon is re-starting, such as when you restart the return pump, it will take up to a minute in some cases to get going again. By placing the valve all the way down at the sump just before the water level, the pipe will go full-siphon the quickest. But in reality, it does not matter much whether the siphon goes into silent operation in 30 seconds vs. 45 seconds for example. You can place the siphon valve directly below the bulkhead, or all the way down at the outlet. The difference in time to go full-siphon is only a few seconds with most tanks. So having the valve in a convenient spot to reach can often take precedence. Dialing in the valve can often take a minute or two until you get the hang of it. So if you place your valve where it’s easy to reach, then you’ll thank yourself later. On my tank (shown in pic above) the valve is just below the bulkhead. It’s a lot easier to dial in the flow when you have your hand on the valve and a line-of-sight to the water level in the overflow. In this case adjustments are made standing next to the tank rather than crouched in the cabinet. In cases where there is a long run in the siphon line, such as having your sump in a basement, low placement is much more important. In this case the valve needs to be located it down near the sump to prevent trapped air in the pipe. This can potentially trip you up if you haven’t set up the method before. The main valve standpipe will work at almost any height you make it as long as its lower than the emergency standpipe. However this is true only to an extent. Help the Siphon get going on it’s own — by having the height of your main valve standpipe inlet about 6″ deeper than the operating water level of the overflow, usually the height of the emergency standpipe inlet. A sufficient volume of water above the siphon inlet prevents air sucking down from the surface into the pipe, sometimes referred to as a Vortex. If one forms, it creates a slurping noise. They will also interfere with the line going into full-siphon. 6″ is a general rule. It is based on the rough dimensions of many overflow boxes. Keep in mind though, it is not as much about how deep, but rather how much water volume is above the siphon inlet. More water volume above the inlet = more water forcing the air down the drain to create the siphon effect. Many of the commercially available overflow boxes are made as small as possible. Why? They are easier to ship, use less material, and have better aesthetics. But with a small overflow box, there is less water volume to purge air down the drain. So the 6″ might not be enough in those cases, or with a larger box, it may be more than you need. The height of the siphon inlet in the overflow is something you may want to experiment with. If you forgo the raised main standpipe (such as on the right of pic above) it will take the guess work out of it, just be warned that ALL the water in the overflow will drain into the sump when you shut off your return pump. This water needs to have a place to go without overflowing the sump. Also – any livestock in there (even if they shouldn’t be) will be left high & dry. This drain is what makes the system fail-safe in the event of the main valve standpipe getting clogged. It should be designed simply as a straight (as possible) unrestricted pipe going down into the sump and into the water, never joined with other pipes. An open-ended standpipe will act as an alarm in a way. With only a small trickle of water seeping into it, it will make no noise. If there is a partial blockage of the siphon line, then the Emergency drain will start to take on more water and you will hear a loud hollow noise, alerting you that it needs attention. This is one reason that you should not try to muffle the Emergency drain. You want the emergency to have max capacity, so most people leave it open and don’t use a strainer on this pipe. Don’t install a valve on the emergency pipe — just don’t…no good can come of it. As a measure to prevent noise from falling water in the overflow, the emergency standpipe inlet should only be around 1/2″ – 1″ below the height of the overflow weir. You want the height of the E-drain inlet to minimize water’s falling distance over the weir… but just high enough to limit splashing, no more. The distance between the E-drain inlet and the top edge of the tank needs to be a few inches to aid with capacity. This is needed in the event of a main siphon line blockage. If this happens, the E-drain will possibly need to go full-siphon as well. If the standpipe places the inlet too high up, a siphon may not be able to engage on the E-drain if it has to before the tank’s water level swells to the top edge of the tank and starts to overflow it. When the return pump switches on, and water starts passing through the overflow, the siphon should engage and go back to normal operation completely on it’s own. While this is happening, you may observe a temporary increase in water going down the emergency standpipe. This should only go on for a minute or so until all the air inside the main siphon line can purge through the outlet down in the sump. The siphon will then engage and take on the full capacity you adjusted it for. Both drain outlets should run down from the overflow into the sump below. The siphon drain must have it’s outlet submerged, but by <1″. Any deeper, and air can’t purge from the outlet as easily when the siphon is starting. It should also be located in a sump chamber with a constant water level. The emergency line is usually also submerged to limit any sound from splashing from running a trickle. This outlet should also be submerged to a depth of by 1″ or less. If the main valve siphon gets blocked, the emergency pipe will take on the extra water. If the e-drain needs to go full-siphon, you don’t want to impede that by submerging the outlet down too far because that is where air is purged. 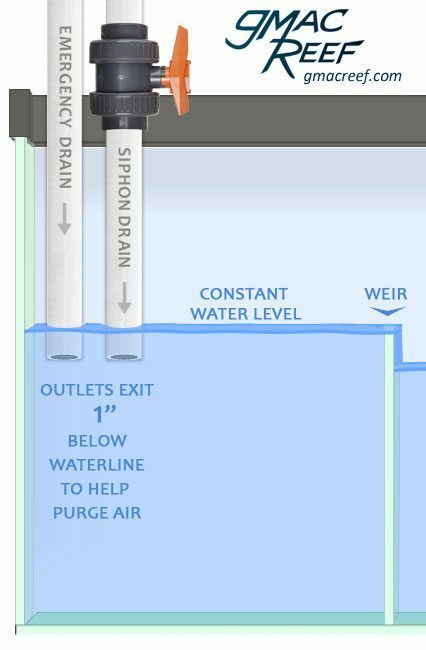 In the diagram, the emergency drain is shown right alongside the siphon drain. The e-drain does not need to go into a particular sump chamber. It should be plumbed the way that provides the straightest path down to the sump without horizontal runs. When the return pump is shut off, the water level inside the overflow will drain and come to rest at the level of the siphon inlet. The height difference between the emergency inlet and the siphon inlet will determine how much water will drain to the sump. Make sure the sump can accommodate the extra water without overfilling. It is also important to note that you should not attempt to Tee off either drain, as it will most likely interfere with the siphon operation, capacity of the emergency drain or cause other problems. Both the emergency drain and the main siphon drain should be run straight as reasonably possible downwards into the sump, as any excessive horizontal runs will make it more difficult for all the air inside the line to exit the pipe down in the sump as quickly. It’s generally only an issue if a horizontal run is over 24″ long. If you have sufficient height, you can get away with longer horizontal runs without too much issue. For the Return line, horizontal runs are fine. This is because returns have water being actively pumped, rather than draining due to gravity only. Doing these things will make the main siphon less likely to clog. Install a Strainer on the Main Valve Standpipe. This will keep any debris, small snails or algae clumps from interfering with the valve and choking off the drain. 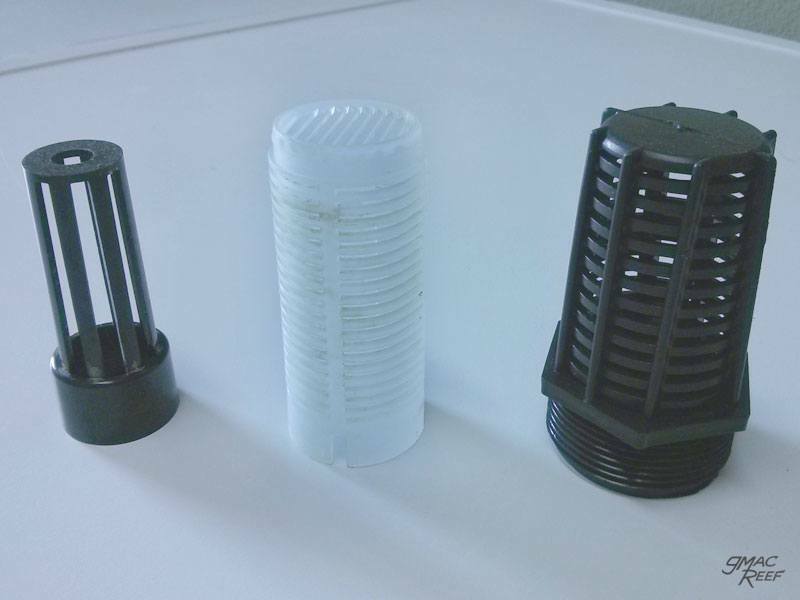 There are different strainers out there, and one with smaller holes will protect better, but clog with junk faster. Try to get in the habit of inspecting the strainer when you observe and check on your tank. After all, you want it to prevent clogs, not be the source of one. You might be thinking, “I don’t need no stupid strainer” — YES YOU DO! With the nature of a siphon, water moves very quickly through the valve opening. Most times you’ll find that the valve needs to be closed-off in excess of 50% shut to achieve balance from the return. A mostly closed-off valve opening is very small during operation. This makes it more susceptible to obstruction by an object. Having a strainer in place is the last line of defense before your main drain clogs. Quick tip – keep more than one strainer (they are cheap): If you have a clean one ready, you can easily swap out the old one without having to shut anything down. This also makes it less likely you’ll forget to put it back on. A covered overflow will prevent livestock in the tank from jumping or crawling inside. This is a good idea to further protect the valve against clogs, and can also help to limit algae growth. You’ll also save yourself having to catch a stray fish inside the overflow which is a real pain. A simple piece of acrylic cut to size does the job. Is the water level where it should be? What is the condition of the strainer? Does it need cleaned? Is there any debris or livestock in the box? 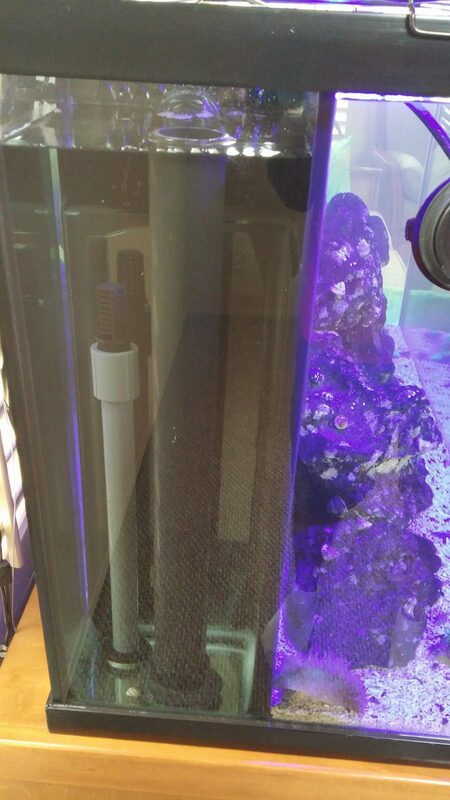 Is my tank’s glass even suitable for drilling holes for bulkheads? Drilling and mounting bulkheads to a tank adds lateral weight and forces on the glass. What this means is that the leverage from plumbing pipe and fittings will create pressure points on the area around the glass hole. These physical forces determine which aquariums are even suitable for drilling. Glass with thickness of at least ¼” can typically withstand these forces, and quarter inch (6mm) glass is generally only found on aquariums with capacity of 40 gallons and up. Don’t waste your time or risk having a future catastrophe later on by drilling a tank that isn’t suitable. If the glass is too thin and weak to support bulkheads, then it’s a lot more likely for cracking to occur. 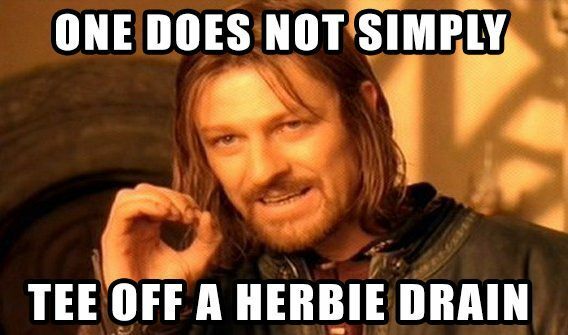 There is a general consensus that the Herbie method should never use less than 1″ pipe for plumbing, no matter what size tank. You want to be 100% sure that your single emergency drain is completely capable of handling all the flow that the return pump can throw at it in the unlikely event of total clogging of the main drain. If your tank came pre-drilled with 2 holes in the overflow as in a lot of older “reef-ready” tanks, use the one with a larger diameter (usually 1″) for your emergency and the smaller diameter one for the main siphon drain. Keep in mind that your flow will be drastically reduced on smaller size pipe. – (See Figure 5 for picture). For systems where return pump flow is up to around 330** gallons an hour, running a 1″ emergency line will be sufficient. For tanks above about 120 gallons you may want to bump-up your plumbing size to 1.5” in diameter. These can handle way more flow. The trend in the last few years is to use efficient powerheads to create high flow in the tank, while running a moderate amount of flow through the sump. This means you can run a smaller, quieter return pump and not push the capabilities of your overflow design as much which is a smart strategy. The return pump also plays a part in the operation of the overflow and in short, simple is better. Any variations you add into the plumbing of the return line can have effects down the line. To avoid having to constantly readjust the siphon valve, the return rate should be kept at a consistent rate. Any fluctuations that would take place from day-to-day should be minimized. A common practice is to to Tee off the line above the pump to feed a Refugium sump chamber, and this is generally okay to do. If you are going to Tee the return line, the offshoot should only direct to a place providing consistent resistance. Some people will add a manifold of valves to direct flow to media reactors. This can be less than ideal with a siphon-based overflow method. If the return pump is Tee’d off and also feeding a media reactor in the sump, then variations in water flow will start to happen. Water resistance inside the reactor will slowly change as the media becomes depleted or dirty. This in turn changes the rate of flow pushed up to the display, then falling over the weir and into the overflow. All this means is that if the setup allows for variations in flow, the valve on the siphon will need to be adjusted more frequently. Inside the overflow, your plumbing fittings can generally be slipped & threaded together. These fittings don’t need to be glued as there is no risk of leaking externally. Having your overflow box fittings not glued allows you to make changes while initially testing out the system. Trying various pipe lengths for the standpipes inside the overflow is often needed. On the exterior of the tank, fittings and pipe should absolutely be glued with PVC solvent (available at any hardware store). Installing unions between the outside of the bulkheads and the plumbing lines/valve is a good idea and allows for the hoses to be removed for cleaning or if you have to move the tank. There are a few initial tests you should do with the system to ensure problem free operation for years to come. Any problems are better to find out in the garage than in the living room. As long as it passes these tests, then you are ready to go. Close off the siphon valve completely in order to test your emergency drain’s capacity. You must confirm it can handle what your return pump is pumping up to the tank with ease. If using a controllable DC pump, make sure the drain can handle flow at 100 percent power. Ensure you have the right sump capacity by turning off the return pump, then watch both the drain and return lines empty into the sump. Make sure it can handle the extra water (also watch your skimmer). There is no reason why this method can’t also work for Freshwater tanks. One thing to note – if you have Freshwater plants, there will be a lot of dead pieces/clippings constantly getting into the overflow system. These can clog overflow teeth, or a strainer. Use care. Ultimately you are responsible for your own tank and your own property — there is the potential for water damage that comes from owning any aquarium. As I have said earlier, the most important thing is to understand how your own system is set up. Learn as much as you can and don’t cut corners. Enjoy your quiet tank! While my original post was written in June 2012, it has grown into a full guide. I have made several edits to clarify some of the concepts and added a few sections based on some if the comments left below and various forum threads linking here. Thanks to those who have participated in the discussion. Ask me a Question using the Contact Form or write it in the comments below. What size tank are you working on?